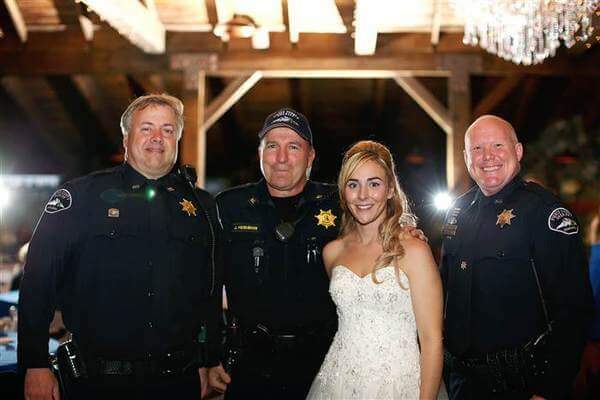 This bride, Kristen Mundell, lost her father when she was sixteen; he was a police deputy and lost his life in the line of duty. 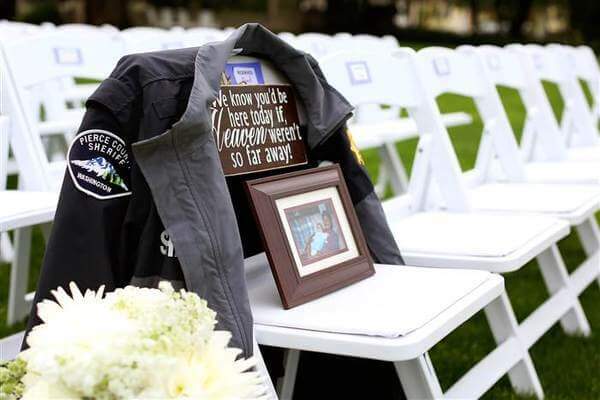 She wanted to honor him at the wedding by dedicating him a seat in a front row with his blue police jacket draped over it. 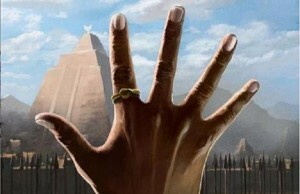 But soon she realised that more people have to honor him and show the support to her on her special day. 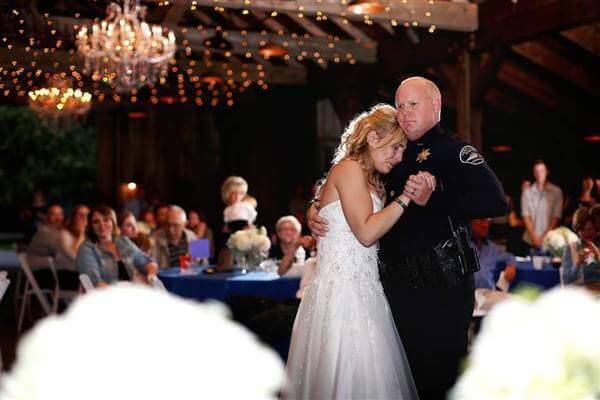 A close family friend, also a police officer and good friend of her father, walked her down the aisle to give her away instead her father and also started the father-daughter dance at the ceremony. But soon Mundell was surprised when more of the wedding guests dressed in blue started the line to finish this dance with her. “I was like, ‘What is going on?’ I was so confused. There were so many mixed emotions. I was so happy to see them but confused at the same time,” she said for TODAY.com. 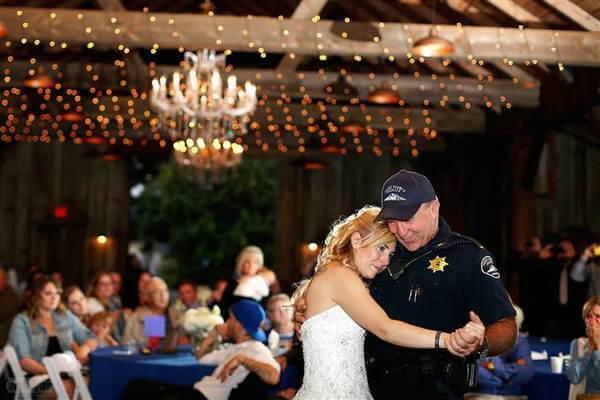 The second officer who danced with her explained briefly that she will always have their support in life. “He was telling me that they’re always here for me, and then I said, ‘I can’t believe you’re here,’ and he said something like, ‘There’s a whole line of us.’ And that’s when the next officer came up,” she said. 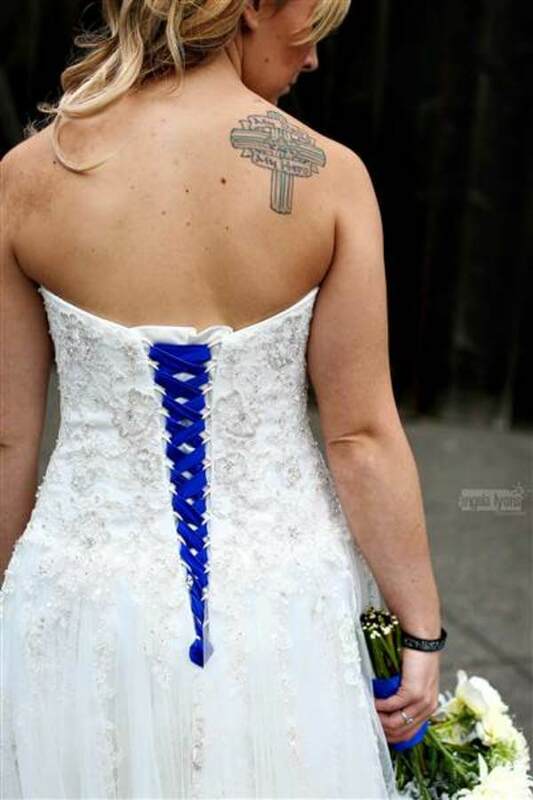 Besides the chair in a front row with the police jacket and picture of two of them when she was only three years old, Mundell honored her father in one more way; she was wearing blue ribbon at the back of her wedding dress. “I knew he was there and watching over me, and proud and happy,” she said. 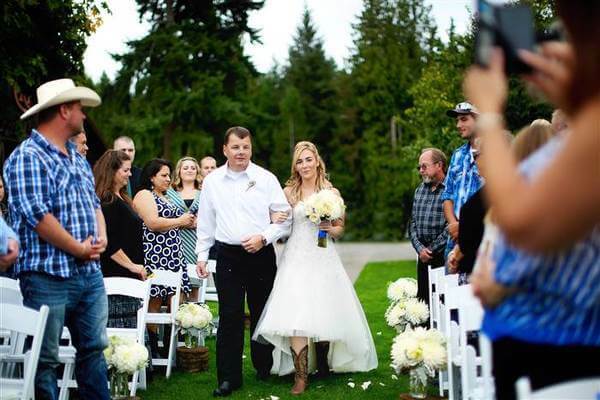 “Now Kirsten can share her story and her father’s memory to all these people who don’t know her and to see there is life after tragedy,” said Don Jones, the Seattle Police detective who walked Mundell down the aisle. “It started with one surprise to make my wedding day more special, and them showing me that they still thought about my dad and they were still there for my family, even though it’s been almost six years.They’re always there for us. 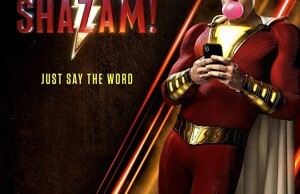 It really is a huge family. I’m so happy it’s gotten attention because it shows the good side of police and law enforcement,” Mundell concluded. And as Angela Lyons, the wedding photographer said, the reception was the real collision of emotions for everyone attending.